Last Sunday Simon Oatley, Trafalgar Wharf’s Operations Manager, set sail from Cowes on his 3rd Fastnet yacht race! Sailing on a F40 Yacht named La Reponse he is sure to have an interesting week of sailing. Previously Simon has had successful results in the Fastnet, including a first and second in class so he has a tough reputation to live up to. 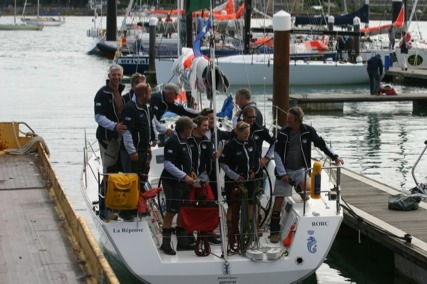 The Fastnet race has been made famous by highs such as this year’s record breaking time set by the Volvo 70 Abu Dhabi of 42 hours 18 minutes and lows including the disasters of 1979. Probably the element that makes it most attractive to sailors is the diversity of boats which enter, from family cruisers to 100+ foot sailing yachts such as the ‘Maxi Banque Populaire'. To follow the race in real time click here.